Flavor Text: But what frightens the frighteners? Exactly what Hastur needs. Yes, you have to make it night, and you will need to have some ways to cause insanity and benefit from it al in the same phase. 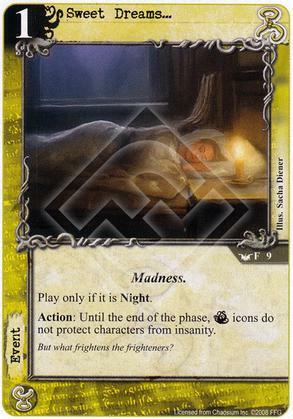 The potential of this card is huge though, imo a 3 of in any deck running night and trying to make opponents crazy. While willpower is a problem for hastur terror icons are even more problematic because they are so common. This card bypasses that headache for a phase and opens up a surprise vulnerability. It may be a dead draw in half of your games but hastur has such an unfavourable matchup against other mythos decks thAt this is worth including even though it may be useless. This costs 1, which is great, but it's generally outclasses by Scotophobia. Scotophobia only affects opponents' characters, and actually removes the icons, rather than just terror immunity, making it so you have guaranteed wins at terror struggles. It also doesn't require it to be Night to cast. Don't get me wrong, the effect is exactly what a dedicated terror deck needs, but it's hard to justify playing this when you have a more solid option available.